If I'm being honest, I'm not a huge fan of mushrooms and neither is Matthew. In fact, we don't like them at all. But, you know what makes a great appetizer? Sausage Stuffed Mushrooms! And, we didn't have this realization until these were made, pictures were taken and we finally had the chance to try one. The combination of the meat, cheese and onion in a low carb vehicle makes this recipe worth trying and making time and time again! The fun part about this recipe is that you can really use any filler you want. Though, normally these are made with cream cheese we opted for cheddar cheese for a stronger bite and better aesthetic. The onion adds a great crunch and the best part about stuffing something with its self is that there is no waste! The mushroom acts with dual purpose in this recipe. Next time I make this I'll probably use an even stronger cheese - maybe blue - and add more crunch with celery! Yum! Baking these mushrooms is an important step in the process. By doing so the mushroom caps get soft enough to eat in one bite. It also melds all the ingredients together into a creamy, crunchy, cohesive filling! A tip I have for you is to scoop out the mushrooms a little with a spoon so that you can get more filling into each cap! This is great especially for those who aren't huge mushrooms fans because you get more sausage, cheese and onion in each bite. The sausage we've been using in most of our cooking lately are Bottos. They have a lot of great flavors and have either 1 or 0 carbs per link. It's important to read nutritional labels when buying packaged sausages, especially, because they can have sneaky sugars you wouldn't normally expect in them! If you do happen to find Bottos you should also give our Low Carb Pasta Alfredo with Sausage a try! Aside from having to be weary of hidden sugars in your sausage, this recipe is a quick, delicious go to. These easy sausage stuffed mushrooms will steal the show at your next food gathering! 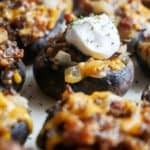 Recipe can be quickly added to MyFitnessPal - Search "KetoConnect - Sausage Stuffed Mushrooms"
Remove stalks from all of the mushrooms and dice the stalks. Dice the onion and combine with the diced stalks. Set aside. Remove sausage links from their casing and cook ground sausage. Once fully cooked set aside to cool. Add onion, stalks, and garlic to pan and cook down until onions are translucent. Transfer to a bowl and combine with sausage and cheddar cheese. Add salt and pepper. Scoop sausage mixture into mushroom caps until you've filled all the mushrooms. Place mushrooms on a baking sheet and bake at 350 degrees for 20 minutes.